ArcBest, led by Judy R. McReynolds (Chairman, CEO and President), unified and simplified its organizational structure on January 1, 2017 to provide its customers with one-stop shipping. Customers now have a single point of contact and dashboards providing excellent supply chain management information, along with assured capacity options and a large network of third-party providers. Sales for both ArcBest’s asset based and asset light offerings (ABF Freight, Panther Premium Logistics, truckload and other solutions) were combined under Chief Sales Officer, Dave Darter. Cross selling ArcBest’s services allows its customers visibility across their logistics activities and gives clarity to performance standards. The unified sales structure also enables ArcBest’s trusted advisors to provide customers with unique insights into optimizing their total supply chain efforts. ABF Freight started in the trucking business in 1923 and became a major less-than-truckload (LTL) carrier, later branching out into U-Pack moving, domestic transportation management/freight brokerage and other areas. Judy McReynolds led the recent reorganization efforts, with a major emphasis on expanding supply chain solutions, since she became CEO in 2010. With the new enhanced market approach of 2017, customer support operations were reorganized. In addition, ArcBest added modern, analytical research and yield management functions. The current company goal is to expand asset light operations to 50% of total revenue. 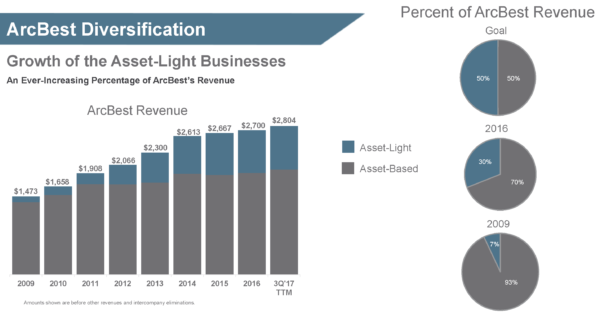 For 2016, asset light revenues were 30% of the total and growing fast. ArcBest was approached by a major retailer who wanted to control its domestic supply chains better. The shipper provided ArcBest with one year of shipment information. ArcBest fashioned solutions involving consolidation and distribution. (A major feature of ArcBest’s strength is its ability to use the over 200 terminal locations of its LTL operation.) ArcBest analyzed the data and offered the shipper consolidation solutions from the West Coast to eight locations. The savings ranged from 21–39%. From the customer’s major distribution facility in the middle of the country to California and four Eastern locations, consolidation of LTL to truckload (TL) lowered costs by 54–72%. Pool distributions from California to the Midwest and Northeast saved 26–35%. The yearly savings for the shipper exceeded $10 million. ArcBest’s Expedite solution, offered through Panther Premium Logistics, is a guaranteed on-time service. Shipments are picked up and delivered within 15 minutes of scheduled times. Panther meets these deadline requirements 98.5% of the time 365 days a year. Panther has 1,100 regular owner-operators. Contract providers are prequalified through the Carrier Excellence Program. Specialized equipment is used as necessary. For example, life sciences shipments need carefully controlled refrigerated equipment. As needed, Panther utilizes the LTL network for special handling of partial shipments. Usually these are air shipments. Panther operates cargo vans, straight trucks, dry vans, reefers and flatbeds. All power equipment larger than cargo vans has sleeper cabs. Hazardous material certification for drivers is standard. The major service center locations for Panther are Medina, OH; Fort Smith, AR and Laredo, TX. The Skill is delivering time-critical shipments to multiple retail locations. The Will is using creativity and collaboration to overcome obstacles to deliver on time. When a customer required a large number of time-critical shipments delivered on short notice, the ABF Freight team found a creative way to ensure its needs were met. The customer requested time-critical service for 37 shipments to multiple retail locations, all requiring ground and inside delivery and all being serviced by one ABF Freight terminal in one day. Chad Wallen, branch manager of the ABF Freight terminal in Knoxville, TN, knew that delivering to 37 locations on a Monday would be difficult, especially considering the special delivery services and delivery times the customer required. On Friday morning, when an appointment clerk noticed the shipments populating the system, Chad contacted Derek Green, In-Net Operations manager with ArcBest’s Expedited Solutions team, to discuss the situation and come up with a solution. They contacted the shipper to determine if the delivery schedule had any flexibility. Chad had developed a plan to deliver some of the shipments on Sunday if the customer approved. The customer agreed and provided a list of stores that would accept shipments on Sunday. Then, while Knoxville dispatcher Chris Cannon began planning Monday’s deliveries, Chad worked with the Atlanta terminal to plan for the Sunday deliveries and Derek worked with the Linehaul department to move two trailers from Albuquerque to Little Rock and then on to Knoxville. When Chad arrived at the Knoxville terminal on Sunday morning, he found that the plan was underway. Some freight had arrived Saturday afternoon and the remaining shipments were en route. But as the driver began loading the shipments for delivery, he realized a pallet jack needed to move the items had a bad wheel. Chad contacted his shop vendor, who promptly came to the terminal to switch out the wheels. About an hour after the driver left to deliver the shipments, he called Chad: The wheel had fallen off the pallet jack and he was unable to make the first delivery. Chad thought fast. He went to a local hardware store, bought rings that hold the wheel onto the pallet jack, and met the driver at the delivery location to repair the equipment. After that, the driver successfully delivered the remaining orders. By the end of the day Monday, all the orders were delivered as scheduled. ABF Freight employees use creativity and collaboration every day to meet customers’ needs. The Skill is collaborating quickly to get an important shipment delivered in one day. The Will is helping a kayak company aid the city of Houston after Hurricane Harvey. When a kayak manufacturer wanted to send kayaks, paddles and life jackets to aid Houston police after Hurricane Harvey, the manufacturer turned to ArcBest and its expedite solution to get the donations to Texas quickly. As floodwaters in southeast Texas rose after the hurricane hit the coastline on August 25, the Houston Police Department continued search and rescue operations. The kayak company contacted Joe Dempsey, senior account manager for ArcBest, to arrange a quick shipment. Joe worked with Bill Blankenship, logistics specialist on the ArcBest expedite team, who quickly booked the shipment through ArcBest’s Panther Premium Logistics ground expedite service. Bill knew the driver likely would run into delays because of the extensive flooding. He kept the customer updated as the shipment was en route, and it moved quickly. “Bill’s calm communication with all parties involved and his ‘Will’ to find a way to get this delivered no matter what ultimately led to a successful delivery,” Joe said. The donated items originally were to be delivered to a government building in Houston and then distributed to rescue teams. However, as expected, the driver experienced significant obstacles because of highway flooding and had to be rerouted more than once. Because of the highway flooding and congestion on alternate routes, the rescue teams took boats to meet the driver in Lake Charles, Louisiana, where they unloaded the kayaks straight onto the boats. When areas flood, kayaks can be used to reach areas that cannot be accessed by larger boats. After Hurricane Harvey, emergency personnel in Houston rescued thousands of people as the storm flooded the city. ArcBest has diversified its multi-channel services to become a premier North American third-party logistics provider. Judy McReynolds has put together a top-flight team to further expand non-asset operations and profitability.